The tension level rose as the clock ticked away. Would Lakers Kobe Bryant take over? No, he remained sidelined wrapped in heat pads all over his body after struggling to move all night. Would Lakers coach Byron Scott call a timeout? No, he wanted his young players to figure things out for themselves. Would Lakers rookie point guard D’Angelo Russell deliver a drama-filled moment for all the right reasons after providing a different sort of drama for the wrong reasons? No, Julius Randle refused to give Russell or anyone else the ball. It was not out of malice amid Russell’s secretly recorded video of Nick Young admitting to infidelities going public. It was not out of selfishness amid the Lakers season-long struggles with what the called “trust issues.” It was out of confidence that Randle would make the play the Lakers needed. Then, Randle dribbled the ball, patiently waited along the block and then performed a nifty spin move. Randle then sank a left-hook shot with 1.9 seconds remaining that gave the Lakers a 102-100 overtime victory over the Miami Heat on Wednesday at Staples Center. Randle attacked his post-shot celebration with confidence, too. He mimicked Sam Cassell’s legendary “Big Balls” dance as the Lakers’ second-year forward marched toward the Lakers bench. His teammates laughed. So did Randle afterwards even when a reporter wondered if the celebration was worth the cost of possibly drawing a fine from the NBA for excessive celebration. “No comment,” Randle said, smiling. That demeanor has become a rare sight to see with the Lakers in recent days. Leading up to tipoff, the Lakers weathered anxiety stemmed from Russell’s fractured relationship with Young over the video snafu. The Lakers (16-59) had also lost four consecutive games. And Randle had only two points and one rebound in a 48-point loss in Utah on Monday while also sitting out in the fourth quarter. Randle attacked all of those negative vibes and posted 13 points and 14 rebounds in what marked his 33rd double of the season. 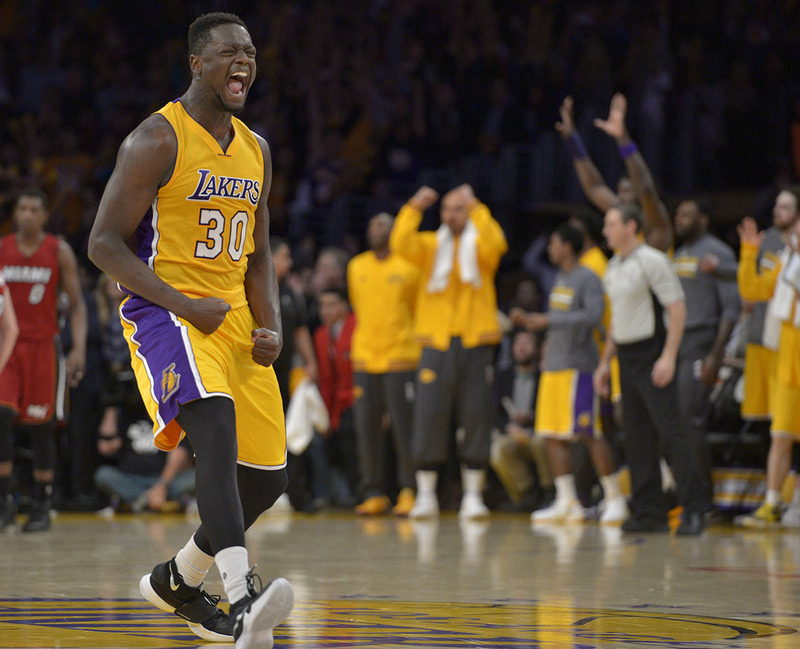 Randle secured a Lakers’ rare victory with confidence, too.